Having pondered the art of BEAM robotics (see links below) I decided I wanted to make something simple. Unfortunately I had no money to spend on the project so I dug out my big box of assorted junk and managed to put this together. Two identical motors were found, both came from seperate VCRs (from my days as an apprentice TV & Video repairer), these would have to do although a set of pager motors would have been nice (http://www.pagermotors.com/ – This is who I would have bought them from, as they auction some on E-Bay). Two photodiodes (I presume from a VCR), a 7404 IC, two transistors (BC548, bought some time ago in a large component set from maplin), two diodes (scavenged from some PCB or another) and a Ni-MH battery pack from an old mobile phone. 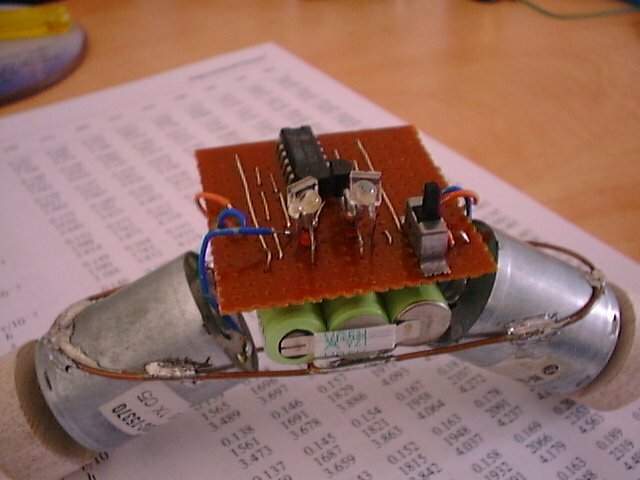 The chassis was made by soldering copper wire to the motors and provides a simple, flexible base for the bot. Two wheels made from balsa wood finish the robot. I’ve now named the robot “xi” – pronounced “cross-eye” for reasons which may be a bit embarrasing: Having completed my phototropic robot and went to test it I discovered that the robot would run away from the light as the two motors were supposed to be connected on opposite sides of the IC, instead of re-wiring the project I twisted the photodiodes so they now cross each other, giving the appearence of crossed eyes. The robot is great and I’m really happy with it. On a full charge the robot will go speeding away, most likely straight into a wall or box, but generally in the right direction. Geared motors would be a great improvement as the speed of the robot is far too high. I’m reluctant however to break it up and use the parts, somehow having a “completed” robot is significantly more appealing than a different (all be it, better working) robot, time will tell (no doubt I’ll eventually steal something off it).